This huge dinosaur dates to about 163 million years ago, in the Middle Jurassic. And it is not only the first carnivorous dinosaur from this period to be unearthed in Germany, it is also the largest ever found in the country: Based on the remains so far recovered, the specimen is estimated to have been between 8 and 10 meters in length. In comparison with other carnivorous dinosaurs, the animal was very sturdily built, weighed more than 2 tons – and was probably not fully grown when it died. Now Oliver Rauhut, a paleontologist in the Department of Earth and Environmental Sciences at LMU (who is also affiliated with the Bavarian State Collection for Paleontology and Geology in Munich), together with Tom Hübner and Klaus-Peter Lanser of the LWL Museum of Natural History in Münster, have undertaken a detailed study of the fossil material, and concluded that the specimen represents a previously unknown genus and species to which they have given the name Wiehenvenator albati. A phylogenetic analysis of the morphology of the specimen revealed that Wiehenvenator can be assigned to a group of dinosaurs that underwent a rapid adaptive radiation during the Middle Jurassic, giving rise to a diverse array of species in a relatively short time. "Practically all the major groups of predatory dinosaurs originated during this period, including the tyrannosaurs – which, however, only gave rise to their really gigantic representatives some 80 million years later – and the first direct ancestors of the birds," says Rauhut. 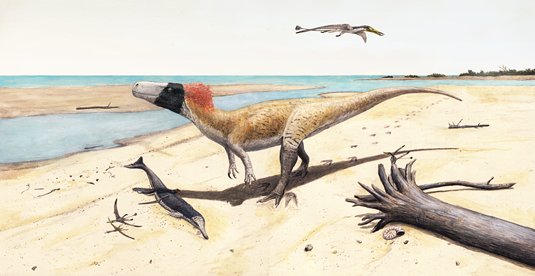 This huge burst of speciation was probably made possible by the preceding extinction of a large proportion of the more primitive forms of predatory dinosaurs at the end of Lower Jurassic, which may in turn have been precipitated by a change in the climate due to widespread volcanic activity.